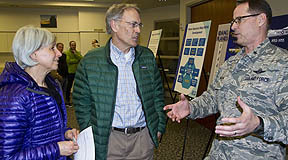 With armed police standing by, opponents of the F-35 and other noisy fighter jets being based at Gowen Field were denied space during an “open house” meeting Wednesday night at the airport, another chapter in the controversy. To us it looked like another case of the new Trump term, “Alternate Facts.” The city of Boise, the Chamber of Commerce and the ANG were armed to the teeth with charts, surveys, arguments, and opinions about why only fighters should be based in Boise and any noise was worth millions of dollars to the economy. ANG brass and Idaho politicos have been allotted more than $100,000 in public funds to shape public opinion in favor of basing the F-35 at Gowen. Despite those efforts, they have failed to convince a growing assortment of Boise Bench residents.